Since I began shooting landscapes the pain of having to fumble with filters has been an issue. Each filter had its own case which would have to be opened, closed, and then put back into my camera bag each time. This might seem like a minor detail but when your shooting landscapes during the peak of great light and you need a filter fast this is a huge pain! After missing the best light of the evening, during a shoot, I decide enough was enough and that I needed a solution. Before I even began to look I considered what the characteristics of a perfect filter holder would be. It would have to hold everything I needed: filters, filter holder, remotes, memory cards, batteries, lens pen, and a small micro fibre cloth. 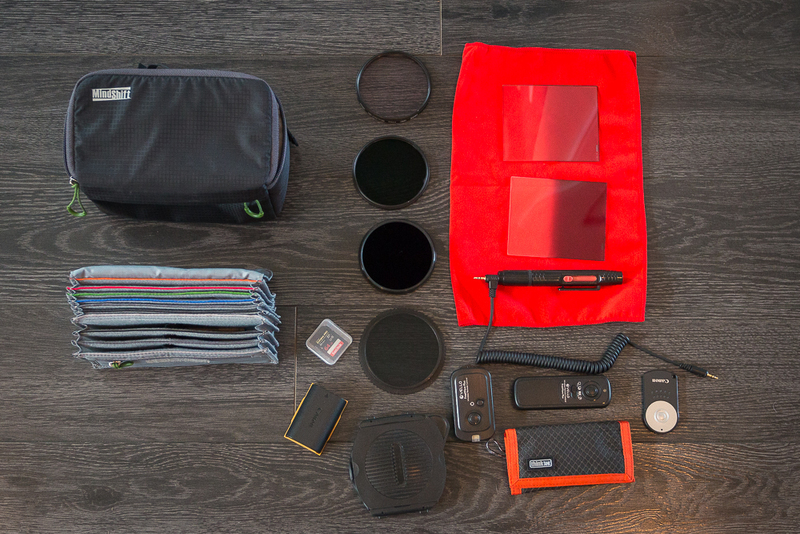 These items are what I consider vitally important when I head out to shoot landscapes. Second, I would need a filter pouch that was big enough to hold it all but not so big that it would become a cumbersome addition to my gear. Also I thought it would important that it could be strapped to my tripop, in order to create a hands free work station of sorts. I set out online to find what I was looking and soon came across the Mind Shifts Filter Hive. 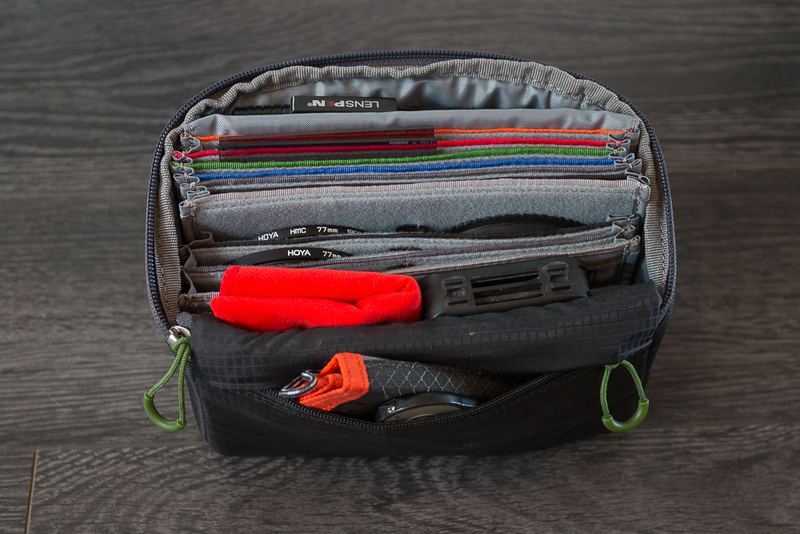 This pouch has all the attributes that I have mentioned, plus it is light, designed with practicality in mind, and is a great looking piece of gear. I quickly purchased it from B&H and in true B&H fashion it was on my doorstep in four days! Considering B&H is in New York and I am based out of Northern Alberta I find their shipping speed, using the regular old shipping option, incredible. Anyway, enough B&H bolstering. The Filter Hive pulled apart and beside everything I use to shoot landscapes. The first intensive landscape I shot using the Filter Hive was Mount Edith Cavell from a lake below it. I have to say that the little Filter Hive did everything I needed it to do. I got to the location at 4am and strapped it to my tripod. It was so accommodating that I was able to leave my camera bag in the vehicle. While wading into knee deep water and balancing delicately on shallow driftwood the Filter Hive the stayed secured tightly to my tripod. During the shoot, that began in pitch black dark, the pouch allowed me access to everything to get the shot I was looking for. Considering that I was standing in water this was a huge bonus. In dryer situations I would have been able to place my camera bag, that held my filters, on the ground. But in this situation, because I was standing in water, I would have had to take my bag off, find what I was looking for, shuffle filters, tuck everything away in the bag again, and then put the bag back on my back. All without dropping a filter or my entire camera bag in the water. Yikes! With the Filter Hive all these issues became moot. Needles to say this solution to my filter woes has been amazing. I strongly recommend it to anyone in the same situation. Now when heading out the door to shoot a landscape all I have to grab is my camera, tripod, and the Mind Shift Filter Hive. Beauty! Inside, I carry 2 ND Grads, three 77mm filters, circular polarizing filter, filter holder, Think Tank SD card holder, Canon IR remote, Vello wireless remote, extra camera battery, micro fibre cloth, and my trusty Lens-pen. Another cool feature of the Filter Hive is that you can remove the inner pouch making it even smaller and more compact. This would be great for a situation where you had limited space and you wanted to throw it in a larger travel or hiking pack. The outer pouch itself is durable and tough, although I wouldn't call it waterproof. So, you might want to tuck it inside a rainproof jacket in the event of a downpour or put it inside a dry sack if you plan on bringing it on a canoe trip. The Filter Hive pulled apart, revealing the inner more compact pouch. Although this piece of gear appears a modest member of my kit, I can honestly say that without it I would be lost. It keeps me organized even when I am not out shooting because even when I am home all my landscape accessories stay within it. Usually, I can find at least one or two bad things to say when reviewing a product. I can honestly say that after using the Mind Shift Filter Hive for more than a few months now I have nothing but good things so say.